The Global Town Hall will allow you to hear directly from Senate candidates whose success in November will help make a Democratic majority in Congress a reality. Without a Democratic majority, the Republicans will continue to pursue their regressive agenda – and they will hold the key to the next Supreme Court appointments. 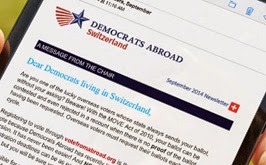 The Global Town Hall is also raising funds for Democrats Abroad’s worldwide Get Out the Vote campaign, helping us reach the estimated 5 million eligible voters who live overseas. We are asking participants in the Global Town Hall to contribute CHF 25 or more to this effort. Register by making a contribution. Click on one of the Global Town Hall options in the Contribution Purpose and donate CHF 25 or more (Guest: CHF 25, Supporter: CHF 50, Friend: CHF 100, Sponsor: CHF 250, or Other). Instructions for logging into the Global Town Hall will be sent to you after you register (make sure to include your email address). You will also be sent a link to submit a question to one or more of the participants. We're talking to members interested in hosting Viewing Parties, a fun way to enjoy the talks by these important Senate candidates, allowing for interesting discussions and exchanges. If you're interested in being a host, contact us. We'll publish details of regional Viewing Parties here should you like to attend one.